Originally this was a private communal garden for residents of Lonsdale Square, which was laid out in 1838 on the Drapers' Company Estate. The land had once been used as a pen for cattle on their way to Smithfield Market. Unlike the gardens in most Islington squares it remained in private ownership until the 1960s, with a gardener employed until 1959. The gardens were then offered to Islington Borough Council for a nominal sum of £50. Railings had been removed during WWII, and were replaced with reproductions in 1970/71 when the garden was restored. Lonsdale Square was laid out by Richard Cromwell Carpenter in 1838 upon Gosseyfield on the Drapers' Company Estate. Gosseyfield had been left to the Company in 1690 by the daughter of former Company Clerk John Walter, for the support of his almshouses in Southwark and Newington, and the land was used for a pen for cattle on their way to Smithfield Market. Carpenter's father had been the first Surveyor for the Drapers' Company Estate and had drawn up plans for pairs of classical houses here. His son became Company Surveyor after his father's death in 1839 and completed the scheme to his own design. A district surveyor for East Islington, he was a church architect and had also built de Beauvoir Square (q.v.) in Hackney. Lonsdale Square has a central garden on the axis with Drapers' Arms Public House to the north, and uncentred on Barry's Holy Trinity Church in Cloudesley Square (q.v.) to the south. Unlike the gardens in most Islington squares it remained in private ownership until the 1960s, with a gardener employed until 1959. 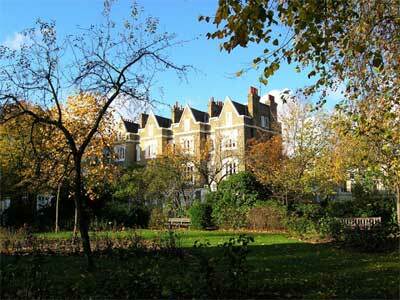 The gardens were then offered to Islington Borough Council for a nominal sum of £50. Railings had been removed during WWII, and were replaced with reproductions in 1970/71 when the garden was restored, having become run down in the interim. Surrounding houses are intact, with Arup Associates offices of the 1960s built behind the façade of buildings in the south west corner.